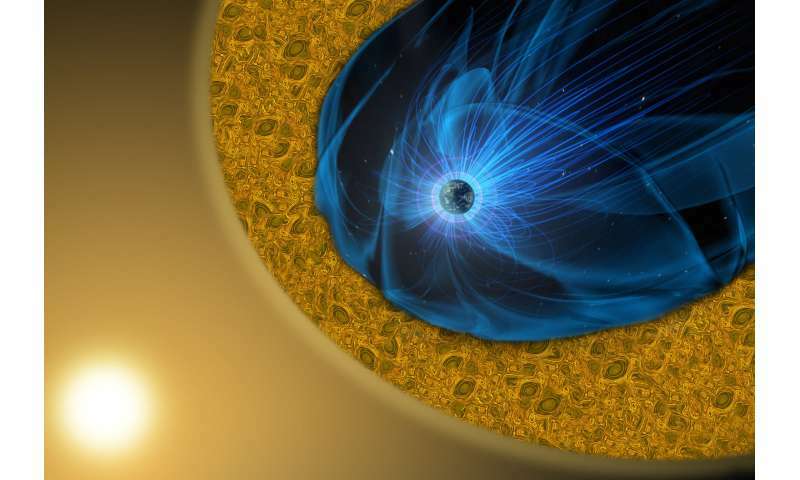 One of NASA's space weather missions, called Magnetospheric Multiscale or MMS, has discovered one surprising way this turbulent energy is dissipated: The magnetic energy is converted into high-speed jets of electrons as the magnetic fields break and reconnect. The discovery will help scientists understand the role magnetic reconnection plays elsewhere in space, for example, in heating the inexplicably hot solar corona—the sun's outer atmosphere—and accelerating the supersonic solar wind. NASA's upcoming Parker Solar Probe mission will be launched directly toward the sun this summer to investigate exactly those phenomena, armed with this new understanding of magnetic reconnection near Earth. "MMS discovered electron magnetic reconnection, a new process much different from the standard magnetic reconnection that happens in calmer areas around Earth," said Tai Phan, a senior fellow in the Space Sciences Laboratory at the University of California, Berkeley. "This finding helps scientists understand how turbulent magnetic fields dissipate energy throughout the cosmos." "Turbulence occurs everywhere in space: on the sun, in the solar wind, interstellar medium, dynamos, accretion disks around stars, in active galactic nuclei jets, supernova remnant shocks and more," said Michael Shay of the University of Delaware, a co-author of the paper. Standard magnetic reconnection is observed in Earth's relatively placid magnetosphere, which is like a magnetic force field that protects the planet from the intense solar wind. Within this region, undulating magnetic fields can cross, break and reconnect; the rejoined magnetic field lines snap like a rubber band and fling ionized atoms at high velocity throughout the magnetosphere. The new process takes place farther from Earth's surface, in a turbulent zone where the solar wind hits a shock wave surrounding Earth and drastically slows. Twice the width of the Earth itself, this zone - the magnetosheath - is highly turbulent. "The turbulence in the magnetosheath contains a lot of magnetic energy," Phan said. "People have been debating how this energy is dissipated, and magnetic reconnection is one of the possible processes." "We now have evidence that reconnection does happen to dissipate turbulent energy in the magnetosheath, but it is a new kind of reconnection," said Shay. Magnetic reconnection has been observed innumerable times in the magnetosphere but always under calm conditions. The new event occurred in the magnetosheath just outside the outer boundary of the magnetosphere. Previously, scientists didn't know if reconnection could occur there, because the plasma is highly chaotic in that region, Phan said. "We think this is because the electrons are fast and light and can easily participate, but the slow and heavy protons cannot," said Jonathan Eastwood, a lecturer at Imperial College London and a co-author of the paper. "Overall, this result opens up new areas of research into turbulent reconnection." MMS consists of four identical spacecraft flying in a pyramid or tetrahedral formation to study magnetic reconnection around Earth in three-dimensions. Because the spacecraft fly incredibly close together—at an average separation of just four and a half miles—they are able to observe phenomena no one has seen before. Furthermore, MMS's instruments are designed to capture data at speeds 100 times faster than previous missions. "The key event of the paper happens in 45 milliseconds. This would be one data point with the regular data," said Amy Rager, a graduate student at Catholic University of America in Washington, D.C., who worked at NASA's Goddard Space Flight Center to develop the technique. "But instead we can get six to seven data points in that region with this method, allowing us to understand what is happening." More information: Electron magnetic reconnection without ion coupling in Earth's turbulent magnetosheath, Nature (2018). I've always wondered... how does an imaginary line break, reconnect and somehow release energy? From what I understand, a magnetic field line is merely the path a charged particle would take within an inherent magnetic field. 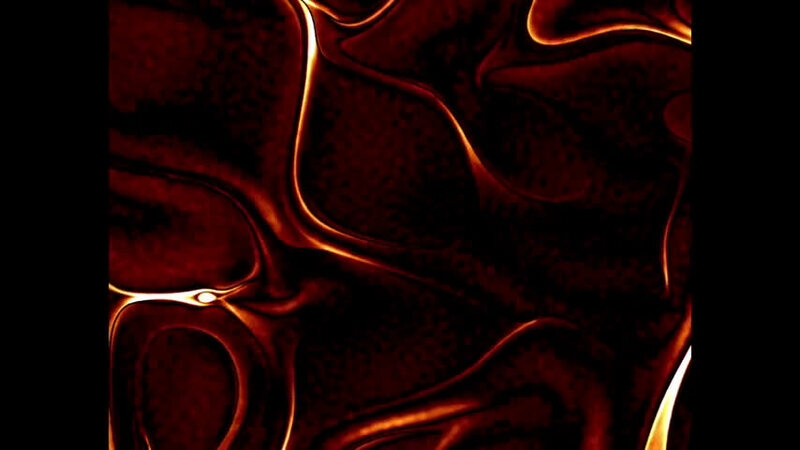 There are an infinite number of 'magnetic field lines' in any magnetic field. The lines aren't real, tangible structures... just like lines of longitude and latitude on earth. It's actually an electric current that carries EM energy. The magnetic energy is converted into high-speed jets of electrons as the magnetic fields break and reconnect. The electron beams are from exploding double layers, it's an electric discharge process as described EE concepts. Magnetic reconnection is pseudoscientific claptrap which is not needed to explain the phenomena. Because it involves only electrons, it remained hidden from scientists looking for the telltale signature of standard magnetic reconnection: ion jets. This is a similar reason why these processes have yet to be observed at comets, they don't even realize how wrong they are. But the neat SAFIRE PDF you linked to on another thread said the double layers are oh so super stable. Why would they explode? When they do explode, do we see a spike in that incoming current stream going into the Sun? Because the spacecraft fly incredibly close together—at an average separation of just four and a half miles—they are able to observe phenomena no one has seen before. jonesdumb and his moron brigade don't grasp the resolution needed to support or confirm the EU theories. "We think this is because the electrons are fast and light and can easily participate, but the slow and heavy protons cannot,"
They just won't let their gravity only beliefs go, electrical engineering concepts of EM need be considered. The new event occurred in the magnetosheath just outside the outer boundary of the magnetosphere. Right where double layers are to be expected. We need to get rid of these pseudoscientific plasma ignoramuses and get some real scientists involved or nothing will ever be solved. Job security for them I guess. For someone to claim they know so much about EM theory you do ask some pretty moronic questions while simultaneously remaining willfully ignorant. The lines represent something - field strength at specific vectors. In a standard bar magnet they remain in the same location. Reconnection is where field strength regains and maintains (for a little while, anyway) equilibrium. nah, just pointing out that you do thoroughly enjoy contradicting yourself. Found that incoming current yet? nah, just pointing out that you do thoroughly enjoy contradicting yourself. There is no contradiction, just an understanding of complexities. Clearly to you everything is as simplistic as yourself. "every circuit that contains an inductance is intrinsically explosive. This is true because a conductive circuit will tend to supply all of the inductive energy to any point of interruption of the circuit." The circuit in question stores the energy until it is released, this is why you don't see large scale effects to the solar circuit. Same as when the breaker is tripped in a home it doesn't cause the whole grid to fail. Found that incoming current yet? Yes, I pointed it out to jonesdumb, he just prefers willful ignorance. Voyager detected it way out by the heliopause where the ion flow doesn't obscure it. You really need to stick with art there WG, your word salad is meaningless. How exactly does "regains and maintains equilibrium" explain these explosive events? "Imaginary lines" of height above sea level seem to work fine for topographical maps, it's not like they're scribed across the landscape or anything. And "imaginary lines" of pressure in the atmosphere seem to work great for predicting weather, considering as how they're broadcast on marine frequencies so ships can avoid the most severe weather. Topographical lines don't crash together and break to cause earthquakes do they? Nor do atmospheric pressure lines twist up into tornadoes. Ascribing magnetic field lines that twist, break, or move to release energy is a relevant analogy and just as false. Actually, earthquakes, landslides, and volcanic activity cause the topographical lines to change; this is obvious. And in fact, atmospheric pressure lines do indeed show the atmosphere twisting up into mesocyclones which form tornadoes. On Earth. Maybe not on whatever planet you imagine you live on, @cantthink69. And not being satisfied with lying about astrophysics and relativity, now @cantthink69 is lying about earthquakes and tornadoes. Is there anything you won't lie about, @cantthink69? What's the matter with you, anyway? Why do you lie all the time? You heard it here first, Magnetic Monopole Man has claimed that topographical and atmospheric lines cause geological and atmospheric activity respectively. No, @cantthink69. You are the one claiming magnetic lines of force cause reconnection; in fact, maps of magnetic lines of force are just a representation of the magnetic field, as topographic lines are a representation of the height field and atmospheric lines of pressure are representations of the atmospheric pressure field. You're lying again, @cantthink69. You've been lying about this for years. Now you're lying about what I said again. Why do you feel the need to lie, @cantthink69? What's the matter with you? See, lying about what magnetic lines of force-- which are merely lines along which the magnetic force is equal, allowing humans to intuitively understand how magnetic fields act-- is stupid, because they're just representations of the field, not the field itself. Along the magnetic lines, the B field has equal intensity, just as along topographical lines, the height has equal value or along atmospheric pressure lines, the atmospheric pressure is equal. You're confusing the equal values with some sort of magical thing instead of understanding them as a tool to visualize the values in a field. Just because you're stupid or lying doesn't mean science is wrong. Get over it. "Within this region, undulating magnetic fields can cross, break and reconnect; the rejoined magnetic field lines snap like a rubber band and fling ionized atoms at high velocity throughout the magnetosphere." Hmmm, weird. Not my words. Clearly 3M is lying. "Magnetic reconnection takes place when magnetic lines of force—or field lines—break apart and reconnect with a violent burst of energy..."
Again, not my words. PPPL pdf handout, presumably written by a "scientist". 3M lying again. 3M is pathological in his lying. "Topographical lines don't crash together and break to cause earthquakes do they?" "Actually, earthquakes, landslides, and volcanic activity cause the topographical lines to change"
Really? You don't say. Why change the subject liar? "Nor do atmospheric pressure lines twist up into tornadoes"
Although less specific, clearly the idea of the lines causing the event is suggested. What does the liar 3M say? "atmospheric pressure lines do indeed show the atmosphere twisting up into mesocyclones"
Again, she changes the subject and lies some more. It's a valid visualization, but it mustn't be confused with the reality of the magnetic fields undergoing fast transition from one state to another. Any more than a change in the topographical lines should be confused with the earthquake that caused the change. In other words, you must understand the entire circuit not just the resulting magnetic field. You're lying again, @cantdrive69. Do you always have to lie? What's the matter with you? I know it has nothing to do with what you said, just goes to show how wrong you are. Visualizing the magnetic field without understanding the circuits that create them doesn't tell the story. Understanding the circuit allows one to derive where the energy originates that ultimately results in these explosive events. This is not a magnetically driven process, it's an electrical circuit driven process. The explosive event is a discharge event, explaining the changes the magnetic field is undergoing doesn't explain why the system exploded. It's why MRx is still such a mystery to the plasma ignoramuses. Ahhh, but you see it's a current that is required to make a magnetic field, not a circuit. Your "explosive event" (not very applicable cuz it's not exploding) precedes the regaining of equilibrium... NOT the other way around. Proximity of opposite polarities. They get close enough, it's like holding 2 magnets close together. Always a surprise when they jump to eachother with force. Ahhh, but you see a current must have a dynamo and must flow in a circuit. As such the circuit must be considered. Grade school stuff. Why do you claim a current "must" flow in a circuit? Let me speak of a current that does not flow in a circuit: the solar wind. It comes out of the Sun, flows to the edges of the Solar System, and merges into the Interstellar Medium in the galaxy. No circuit there. The solar wind doesn't come back. Art WG, art. It's a discharge process, when you grab a door knob and you get a shock (the not very explosive event as you'd put it) the arc is the equalization process...NOT the other way around. Those electrons trading places equalizes the charge between the two plasmas/objects. Once again, grade school stuff. Hmmm, where do the electron beams arise in your reconnection? Do you understand an electron beam in plasma is equivalent to lightning in an atmosphere? Once again, it is an electric discharge process. That's not my claim, regarding currents that create magnetic fields they must flow in a circuit. How about a current in a river? Does that flow in a circuit? It doesn't seem as if currents require circuits. I think you're wrong. Meanwhile, let's keep in mind where a magnetic field comes from: it's the speed-of-light delay in changes in the electric field caused by moving charged particles. I don't see where a circuit is required for charged particles to move. There're lots of charged particles in the solar wind, and there's a magnetic field, but there's no circuit. I think you're wrong about that, too. And electric charge can certainly move without a circuit; I can prove that by rubbing a stick of amber with a fur coat. Then later I can give you a zap with the charged amber, and a current will flow then too, without a circuit. No, I'm pretty sure currents can flow without circuits. cantdrive85> You really need to stick with art there WG, your word salad is meaningless. How exactly does "regains and maintains equilibrium" explain these explosive events? Right, off you go. Start listing the tests Don't be shy. No word salad, just a numbered list will be fine. jonesdave expression " Don't be shy. No word salad," - is exactly the same as your expression "your word salad is meaningless" cantdrive85, is your use of the phrase "word salad" just you, or jonesdave? By your description, it would seem that the Sun is a form of LRC circuit, correct? What is the LRC resonance frequency for the sun? Should be simple to find out after each "explosive event" or "capacitive discharge" that occurs, right? When charged particles move they generate a magnetic field, like electrons flowing though a cable generate a magnetic field around the cable. Does the solar wind generate a magnetic field when moving? If yes, is the generated magnetic field of the solar wind the field that interacts with the Earths magnetic field? "regarding currents that create magnetic fields they must flow in a circuit." Ambiguous currents don't require a circuit, to create a magnetic field via current there must be a circuit. That rules out filamentary plasma stretching millions of light years with magnetic fields, they have no circuit so they have no magnetic fields. Streams of plasma from the sun to the earth have oppositely charged ions travelling parallel to each other and in the same direction, so that is not a circuit. But it has magnetic fields and is deflected by the interplanetary magnetic fields from the sun to earth. Obviously for ionic currents and their magnetic fields, they do not require a circuit! Does the solar wind generate a magnetic field when moving? The solar wind is a stream of charged particles released from the upper atmosphere of the Sun, called the corona. ... Embedded within the solar-wind plasma is the interplanetary magnetic field. If yes, is the generated magnetic field of the solar wind the field that interacts with the Earths magnetic field? The properties of the Earth's coupled magnetosphere–ionosphere system are dominated by its interaction with the solar–wind plasma, mediated by magnetic reconnection at the magnetopause interface. Ions have a magnetic moment, as do electrons; flowing from the sun in the same direction is the same as an electron with its magnetic moment flowing in an infinitely long conductor is a current and magnetic field. Proof ions and electrons do not require circuits for magnetic fields as a consequence of their magnetic moment. Not understanding what you mean by "opposite". Wouldn't they attract to eachother? a "current" happens when the resistance is reduced to a point of not resisting voltage travelling from potential to drain. This can vary with distance, conductive material and/or difference of potential tween source and drain. Space is a resistor. Aren't the ions (mass) the conductor? And the Sun the source and interplanetary space the drain? @Whyde, an electrical circuit is a closed loop. What you've defined is an electrical *network*. That covers any interconnection of a source and a drain. An electrical *circuit* is so-named because it makes a *circle*. A circuit is the specific type of electrical network that is a closed loop. As for an electrical circuit without a "dynamo," try a filter. It's very definitely a circuit; it contains components within the circuit; but it has no source and it has no drain. There's no battery. @Lenni, this is the difference between someone who hears talk among their betters in the breakroom and someone who went and got an education. Whydening Gyre:- Not understanding what you mean by "opposite". Wouldn't they attract to each other? Apparently not, according to jonesdave; oppositely charged ions coexist in close proximity in the solar wind moving parallel in the same direction. Jonesdave is quite knowledgeable on these matters; it's a pity we have his nemesis cantdrive85 to negotiate with. I thought what you thought, but he said no, their flowing in the same direction unaffected by their polarity to one another. Are these completely stripped ions, then? Or variable electron inclusion ones? Isn't the solar wind part of the mechanic that carries/stretches the solar magnetic field? And which magnetic fields are "breaking/reconnecting"? Solar or Terran? @Whyde, you can look at it that way if you like. One of the interesting things about EM is that there are at least two and almost always three different ways of looking at EM interactions. They're all equivalent. When two magnetic fields reconnect they are both doing it. Your question doesn't make any sense. Without there being two fields there's nothing to reconnect to. Think about the second stage of neutron mass-wave traveling at ultra sound speeds. It causes constant affine distortion mimicking the GW strain shape of Neutron Star merge, especially at full/new moon stages when the Sun/Earth/Moon locations are aligned. If there is some regular GammaRayBurst event close to that direction and the EM radiation intensity of its afterglow increases 4-fold (vs. decreases as expected) then something is wrong this picture of the Nobel rewarded interpretation of 8/2017 'proof of directly observed GWs' caused by NS merge. Or what? Solar wind doesn't reach Earth's surface. You are only looking at part of the circuit. I thought you had to have a circuit, @cantthink69. A Birkeland current is not a Birkeland current but an Anders Celsius currant! Dear Cantdrive85, you have almost certainly come across The Slippery Eel Theory, you get full marks in its implementation! You obviously didn't read Alfvén's paper, he indicates how these are circuits. That idea is so 19th-century, you're older than I thought WG. Space is plasma, which is a conductor. There are no wires in space, the circuits are closed by the conducting plasma. Just as these phenomena require circuits in the lab so too do they require them in space. Not one of you has definitively shown there are not circuits, only made hand wavy claims there aren't. Welcome to the wonderful world we atheist's inhabit cantdrive85, it not like anything you have been previously experiencing, others are experiencing views you are currently letting slip by in the yah boo of your nemesis scientific advisor, I thought he had mellowed with his latest experience and brief sabbatical, but no! there is no let up. I fear a complete melt down is due if he doesn't look reality in the face. Despite the fact you can match him like for like I feel you're on a higher plane because you take it like water of a ducks back even though the strain is begging to show! cantdrive85> There are no wires in space, the circuits are closed by the conducting plasma. Just as these phenomena require circuits in the lab so too do they require them in space. Not one of you has definitively shown there are not circuits, only made hand wavy claims there aren't. There are circuits, but not in the conventional sense we perceive them in copper conducting wires in circuits in the lab. Conducting circuits in nature are not immediately obvious because nature is not a machine constantly following conventional electrical theory as written in text books. This is an aspect I have not looked into but instinct says there are electrical circuits; it's just a question of realising how nature is achieving them. You are so eloquent I don't know what you are saying. No doubt they are not true 1:1 textbooks circuits, but the plasma does require the circuitry to remain a plasma. Without an energetic input cosmological plasmas will recombine and be the gas astrophysicists pontificate fanciful about. And now I am more confused, after ridiculing me for suggesting there is a plasma circuitry you now seem to agree it is valid? Could the lighting take place between ionos- or magnetospheres and the Earth crust, and then travel along the crust to shake LIGO mirrors from one single arrival direction? Or could the effect of plasma bolt bounce through the iron center of Earth and then affect within 15 ms arrival times any GW receiver station on Earth surface? Yeah, you can use the water cycle to pretend rivers have "circuits" too. The problem comes when you start trying to define part of the "circuit" as "a miracle occurs." @cantthink69 is lying again. A hint of jealousy or is it just your theory Da Schneib? Da Schneib> Yeah, you can use the water cycle to pretend rivers have "circuits"
Is that a hint of jealousy running in the cycle of steams of inter nebulosity of plasma propelled galactic magnetic fields. Me personally I do not believe in theories, theories are all in the mind as they all ways come and bite you when your theories fall flat. We only have your word Da Schneib, but do not despair, unburden your soul for all to see the error of their ways. If the future is what I see in you Da Schneib, I do not want to grow old ending up on a science forum exchanging expletives on who can demonstrate with greater vigour cantdrive85 is lying again! It does if the connection changes. Only just seen this moronic lunacy. WTF has this got to do with comets? Like to know what instruments Rosetta had that were capable of detecting electrons? And ions? And did so? Ditto with Giotto and Vega I & II, back in '86 at Halley? Trust me, when the fireworks are at their most intense, the solar wind is getting nowhere within cooeey of the comet. As measured. Oh they can still detect electrons and ions and, overwhelmingly, neutrals. However, they are all headed in the wrong direction for the neo-Velikovskian idiots that cantthink worships. What the hell is this idiocy? "Where the ion flow doesn't obscure it"? Obscure what? 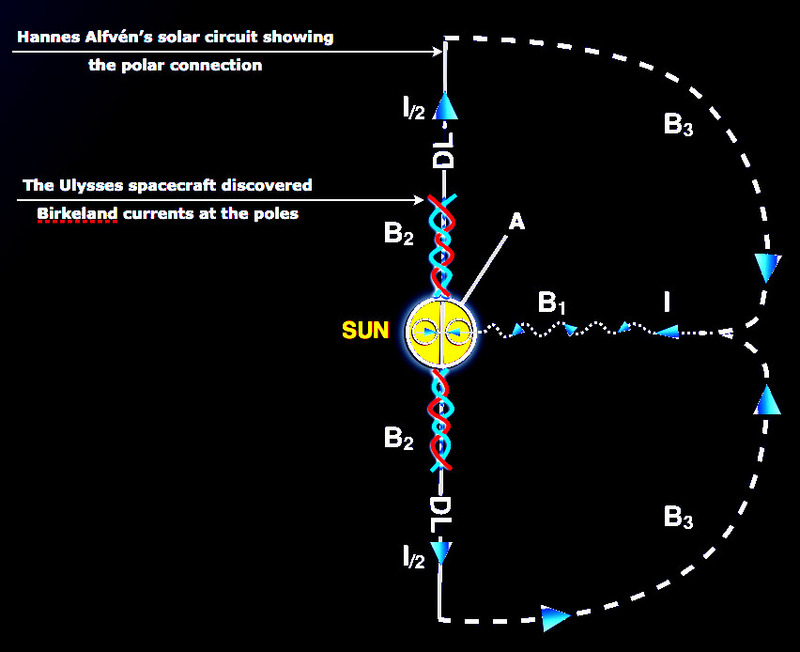 If the piece of 1970s technology that was Voyager could detect electrons at the heliopause, where there are also ions, why the hell can't we see anything other than electrons and ions heading out with 21st century technology at 1 AU? The electrons at the heliopause do nothing for EU woo. You need them here. They aren't powering sh*t all the way out there, are they? You fail to understand very basic science - the ions and electrons of the solar wind are carrying a magnetic field with them. Anything incoming is going to be diverted around that field. No Sun powering currents exist! Nor can exist. Pure woo. Where is plasma not IN space? When it's IN a fluorescent bulb. The culmination of an academic education, exchanging expletives! The statement the Solar wind doesn't reach Earth's surface is not exactly true, the weak spot in the earth's defences are the magnetic poles, there solar activity is visible from your igloos when the going gets too hot for tablets, pity there's no internet at the poles. Welcome to the future boys, we will look in from time to time, the chain your building is a long one. What a sad future, growing old ending up on a science forum exchanging expletives. When is plasma not in space? The archaic answer:- when it is in a fluorescent tube does not take into account the atoms in the vacuum of the tube are in the vacuum of space where 90% of the volume is occupied by empty space is the equivalent of the same plasma in the vacuum of space in between the galaxies. In case exchanging expletives has addled the mind; if every one has not forgotten, we are in the vacuum of space as Sir Isaac's Newton's laws demonstrate unequivocally the earth we inhabit is clearly in the vacuum of space. Idiotic statement. Of course there is plasma in space. That is as far as EU understanding of such matters goes, though. After that they just turn it into some magical substance that can do anything it likes, at will. Such as bolts from the blue to create craters; turning a quasi-neutral flow into a current; magically forming a z-pinch to form stars (lol); combining with non-existent negative ions to form water at comets, even when it is getting nowhere near the comet. Etc, etc. That is why the EU cult only attracts semi-educated buffoons who do not have the requisite education or training to realise that their belief system is based on unscientific bobbins. Obfuscation of plasma is when it's always in the vacuum of space! cantdrive85> Where is plasma not IN space? Da Schneib> When it's IN a fluorescent bulb. jonesdave the standard meaning of the phrase "Where is plasma not IN space?" is normal meant to mean there is plama in space, where Da Schneib has taken what I assume to mean "When it's IN a fluorescent bulb" where you jonesdave have changed the standard meaning assumed by Da Schneib and cantdrive85 to make it look as though cantdrive85 is lying again, when yourself jonesdave and cantdrive85 are saying the same. Is this not your skilled use of the art of Obfuscation! ^^^^^^^Wrong. From long experience, and despite the crap grammar, cantthink means "whereabouts in space is plasma not present?" Which, as I said, is irrelevant. The vast majority of that plasma is quasi-neutral, and even where it isn't, it cannot do the things that the EU wooists wish it to do. Because they simply don't understand plasma physics. At smaller scales, the positive and negative charges give rise to charged regions and electric fields, but overall to neutralise a plasma involves the charges cancelling each other out which can only be achieved in circuit even if this circuit cannot be visualised in the conventional manner! There is an art to this, which is the equivalent of diffusing the electrically charged plasma in a circuitous manner. Whatever this theory is, as EU is only a cover to obscure what this theory is ultimately for. You have to have the stamina of Einstein to get theories accepted, as you probably have not come across any to make any kind of impression on Albert's work and you never will, certainly not here. I am just interested in the science of theses plasmas, this is not going anywhere and when everyone finally has a nervous breakdown, cantdrive85 will calmly stand, up dust himself down and calmly carry on unabated, but still - this EU cover theory is still not going anywhere! Quasi-neutrality describes the apparent charge neutrality of a plasma overall, while at smaller scales, the positive and negative charges making up the plasma, give rise to charged regions and electric fields. This is exactly correct, it is an unequivocal fact. As a matter of fact the above paper shows this to be fact by direct observation. This is also correct, because everyday that pass more and more observation, data, and experiment shows the PC/EU models to be far more accurate than the standard theory. Obviously it is not 100% correct, but it is far closer to reality than any other alternative. The vast majority of that plasma is quasi-neutral, and even where it isn't, it cannot do the things that the EU wooists wish it to do. The irony is monumental! jonesdumb posts this comment in an article which shows the violation of his quasi-neutrality at small scales and plasma is doing just what the EU claims it should do. Also, by these observations of the complex turbulence of the plasma it should be obvious that one cannot claim that a certain percentage of the electrons are not drifting towards the Sun. As they are negatively charged, electrons will "drift" to positive charge. And will repel from negative. Pretty simple. But the Sun is an electric discharge, it is clearly not as simple as you claim. The above article shows the claims to be true or the complex interactions observed above would not occur. Did you even read the above article, or did you just jump to the comments and continue to spew your obviously erroneous beliefs? Nope. Not a single piece of evidence backs up any EU or PC woo. The more we find, the more they drift even further into the background. Nobody of any note has ever taken EU seriously, and, while PC had a handful of adherents, they are slowly dying off, and not bothering to publish much any more, due to the total lack of evidence for, and the mountain against their half-baked ideas. Jesus H. Christ! How many times do I need to explain this to EU thickos? You cannot have reconnection in an ideal plasma. Frozen-in **needs** to be violated. Why do you think Alfven wasn't a fan? It was his MHD that needed to be violated for it to happen. Others, totally ignoring Alfven, realised he was wrong (i.e. Falthammar, among pretty much everybody else), and continued to experiment or look for reconnection from satellites. And they found it. And nobody thinks Alfven's exploding DLs nonsense is the cause. Not a single person. Only EU loons. It is ancient history, before we had PPPL doing reconnection in a lab, and Cluster, Themis and MMS finding it in-situ. Theory is fine, but as Alfven said, experiment is better, and observation is even better than that. Lol. No, it isn't! How idiotic. What is the charge on the Sun? Why are electrons and ions (opposite charges!!!) leaving it in the same number, at the same speed, and in the same direction? Only an idiot would propose such a thing. Such as Scott. More rampant stupidity. These electrons are coming **from** the Sun. That is why they impact the dayside magnetosphere! If there were shed loads coming the other way, the nightside magnetosphere would also be compressed. It ain't. If there were electrons drifting toward the Sun, they would be detected by satellites away from the turbulence of the magnetosphere. You'll find that there are satellites designed to do just that. The ACE satellite being one. Not a single piece of evidence backs up any EU or PC woo. Obviously jonesdumb didn't read the article either, still stuck in beliefs of pre-space-age guesses. Why do you think Alfven wasn't a fan? It was his MHD that needed to be violated for it to happen. This just goes to show a true believer will lie through their teeth to protect his beliefs. jonesdumb, you are a pathetic pathological liar. "As neither double layer nor circuit can be derived from magnetofluid models of a plasma, such models are useless for treating energy transfer by means of double layers.They must be replaced by particle models and circuit theory. A simple circuit is suggested which is applied to the energizing of auroral particles, to solar flares, and to intergalactic double radio sources." Magnetofluid models are MHD, and he says they are useless in this description. Clearly the opposite of what jonesdumb said. This is like saying the amber rod is an electric discharge. It's word salad. Seeing as the vast majority of the plasma is quasi-neutral and plasma is composed of ions you cannot have quasi-neutral plasma by definition! Because as plasma cools it returns to a neutral state of ions having their electrons and protons returned to their atomic state. Plasma is ionic and charged! If it is neutral it has its electron configuration intact as an atom. Obfuscation in a quasi-neutral plasma that is ionic! This Definition I Have Just Derived sounds to me like Obfuscation - - (Seeing as the vast majority of the plasma is quasi-neutral and plasma is composed of ions you cannot have quasi-neutral plasma by definition! Because as plasma cools it returns to a neutral state of ions having their electrons and protons returned to their atomic state. Plasma is ionic and charged! If it is neutral it has its electron configuration intact as an atom) - - An attempt by others to lead to different conclusions "Obfuscation" in the wording of the meaning of what constituent a plasma as an ionic state veiled as a "quasi-neutral plasma"! Quasi: almost but not quite, is an ionic plasma! Quasi in the Cambridge English dictionary: "used to show that something is almost, but not completely the thing described"! With no disrespect to jonesdave, the interpretation in his comment is clear "The vast majority of that plasma is quasi-neutral" he is indicating what we are dealing with is effectively in heat of argument not plasma, so can be discounted even though it constitutes 99% the mass of the universe. But now we know it is ionic plasma! The reason 99.9% of the universe is plasma is the stars, they consist of plasma constantly ejecting plasma we call the solar wind for our sun and cosmic rays for external suns (stars). It is no coincidence 99.9% of the universe is plasma where all plasma is ionic and ionising. But in quasi-neutral world of plasma. Plasma is an electrically neutral medium of unbound positive and negative particles - A completely contradictory statement, Of course if you turn 1kg of hydrogen into electrons and protons you have plasma and if you total the number of electrons and protons you have electrically neutral plasma, the epitome of Obfuscation! The human emotion of "Obfuscation"
It is the theorist who coined the phrase "quasi-neutral" and introduced this quasi-neutralism concept into plasma and by doing so introduced the human emotion of "Obfuscation". It was intentional as the plasma is charged but collectively is neutral. As it was jonesdave who stepped up the scientific intellectualism of plasma by introducing quasi-neutral plasma and it is no coincidence jonesdave has introduced quasi-neutral plasma because it is obfuscation and jonesdave has taken Obfuscation, turning it into an art-form so now he's a specialist in the art Obfuscation which I agree is a very useful tool in the heat of scientific argument, but for every action there is an equal and opposite reaction:- you equally have to have the skill in spotting Obfuscation's use! We know now why it is used; it puts your opponent at a disadvantage! The visualization with field lines is just that - a visualization aid. In EE you get taught to look at it another way(using surfaces of equal potential), which makes a lot more sense. If you use field lines you run into the problem that you want to depict field strength by how densely packed the lines are...which in turn sometimes leads you to have to start or end lines in 'mid-air' (which is unphysical).